With its black background and bold red and white font, Jetbull Casino boasts a striking website design that certainly matches its prominent name. There are a number of pretty lucrative promotions emblazoned across the homepage that are likely to mean online casino enthusiasts would remain on the site and take a deeper look. On its about page Jetbull informs it has been operating since 2007 and it is fully licenced in both the UK and Malta. The site also informs it offers a wide range of live casino games, as well as live lottery games, virtual sports and an award-wining sportsbook. One headline proudly inscribed across the homepage is the fact the site is home to more than 1,100 casino and live casino games – that’s a lot of choice for discerning online casino players. In fact the site claims it is home to the largest selection of casino games in the world! Another attractive headline is the site’s 100% Welcome Bonus. Make your first deposit and Jetbull will double it up to 150 euros (approx. £106) to play with on its wealth of games. With Jetbull Casino you can also earn cashback on any casino bets you make through the site’s Frequent Player Points. All players participating on games on the site automatically become part of the Cash Rewards loyalty program. The Frequent Player Points earned can be redeemed as cash. With images of attractive women dominating the Live Casino page, there’s certainly a lot of appeal on Jetbull’s Live Casino! 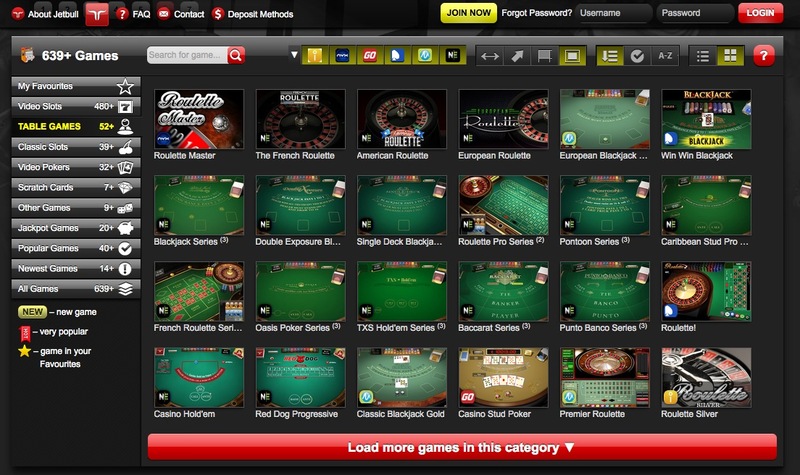 Players can try their luck against the site’s professional and pleasant dealers via a live video stream. The site claims that its ‘user-friendly’ gaming interface creates the feel of a classy, real-life casino from the comfort of your own home. And there’s plenty of live casino games on offer on Jetbull. Immerse yourself in European Roulette, French Auto Roulette, Blackjack Party, Three Card Poker, Baccarat VIP. Casino Hold-em, and the many more exciting live casino games you can participate in on Jetbull Casino. Sports betting fans will also be in for a treat on Jetbull Casino. You can hedge bets on a myriad of different sports matches, including football, tennis, basketball, baseball, ice hockey, rugby union, handball, and many, many more. The sports page also gives a live overview of many of the matches currently being played. And that’s not all. Members can even play the lottery on Jetbull Casino and are able to place a diverse range of bets on 5, 6 and 7 ball lotteries. It stands to reason that such a professional and all-inclusive casino site would offer their services and games to a mobile audience. On Jetbull players can participate in Sports, Casino and Live Casino games from the convenience of their mobile devices. As well as having the largest selection of casino and live casino games in the world and a number of attractive promotions, Jetbull informs it provides award-winning customer support via both email and live chat. Yes we have to admit, we definitely like this casino site.